In chapter 15 of Hemadpant's Shri Sai Satcharitra, the author narrates a tale of Das Ganu being chided by Baba as "Dulhe Raja" (bridegroom) for dressing vibrantly for making kirtan, and being asked to take of his turban etc. While depending on one's attitude one can make several good interpretations out of this story, I also have one. What Baba meant to say was that in the path to spiritual progress, getting rid of ego is the most important and difficult part. And as one endeavors to do so, he risks adopting an ego of religion or delighting in such act. Though Das Ganu was doing a fine job of singing Baba's glory and spreading His name, but somewhere in his donning the colorful clothes a unique ego or that of making pomp and show of his doing so was apparent. While reading Isha Upandishad, I came across a verse that says that in pursuing worldly objects one heads into blind darkness, and into even more blind darkness is the one who delights in Brahman or sambhuti. Sai Baba is the Best Teacher or Guru of Upanishad, and this tale is reminded to be read daily (see the closing statement of chapter 15 of Hemadpant's Shri Sai Satcharitra). Very true as baba has said walking in the spiritual path attaining Bhrama should be the real goal of life.Relating to ur topic i heard discourse fomr Shri Moraji bapu today he was telling about Sri Vali's death part.When Shree Sai Ram shoot an arrow to kill him and when vali falls down rama foes near him and talks to him.Shree Rama says i did not kill u but i killed ur aham which was covering over trueself.And Rama says if u want i will make u alive and u can rule now for ur aham is destroyed now bcos u have taken my refuge,.But he refuses saying a mans vanity dies when he accpets defeat so let me go to next world.But, he entrusts his sons hand in the hands of Lord Rama and says My son is very humble like i am now at ur feet kindly accpet him and guide him always. The toughest moments of life are actually the turning points. It is from these moments that we learn and grow. Keep your faith in Sadguru and he will guide you through all the difficult decisions. Always remember that Baba said you need to want something earnestly enough for it to happen. Baba cares a lot for all of us. Sometimes we wonder what have we done to suffer so much and then suddenly he gives us everything we want. This is his way... He shows us the path to faith and patience. Believe in him and life becomes very simple! As we start the new year, we should remember Baba every moment and thank him for the beautiful life we have. He has painted our life with various color of love and compassion. Let us always respect others, be kind to everyone, give with an open heart and always be truthful. This is the shortest way to reach Baba. Sometimes life faces us with extremely tough situations. It is in these times that Baba is closest to us. We need to keep firm faith and patience. May he guide and bless every one. We spend time trying to make decisions, as if we are the decision maker. The truth is that Baba is the decision maker of our life and He has the supreme power. Just think of Him when you are confused.. He will make the decision easier for you. Sometimes on the street I see people running from one end to the other. People fighting on the road, honking to get ahead and reach quickly. Where are we all running? I dont have an answer.. but all I can say is be patient and treat every one with love. Thats what Baba believed in.. If any one upsets you dont shout just smile and forgive..
Shirdi Sai Baba devotees We are tested every day, every minute and every second on our faith. Just stay calm in all situations, Baba is with you. Baba always said be kind to every one. Even if you dont want to give to someone always be nice to them. You never know in what form will Baba visit you today. Maybe the next beggar, your domestic help, you never know. Be prepared! When we really believe in Baba then every action we do has to reflect of his teachings. We have to surrender every thought to Him and then the difference between right and wrong will come on its own..
May Baba always guide us..
What a beautiful saying. Just Heart Touching! Thank you Subhasrini Ji. 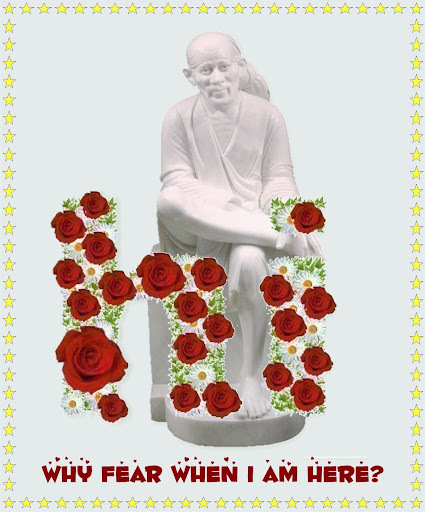 May Sai Bless you! Sai Baba cares for us like a mother, He full fills our smallest desires and sometimes does not give us what we really want. The truth is that He knows whats right for us and is always waiting to shower us with His love and grace. We are lucky to have Him always there. When in trouble I just close my eyes and think of his feet.....it moves away my fears.. Thanks Baba for always being there !!!! Page created in 0.199 seconds with 64 queries.